THE 2019 Federal Budget continues to ignore Australia’s most disadvantaged citizens, St Vincent de Paul Society national president Claire Victory said. Ms Victory said the Budget, delivered by Treasurer Josh Frydenberg, failed to address two dominant drivers of poverty and disadvantage in Australia – the soaring costs of basic housing and below-poverty-level income support payments. “We are disappointed this Budget neglects the urgent need for a comprehensive and long-term strategy that will tackle the ballooning problems of homelessness and housing for low-income earners, including a much needed increased investment in social housing,” Ms Victory said. 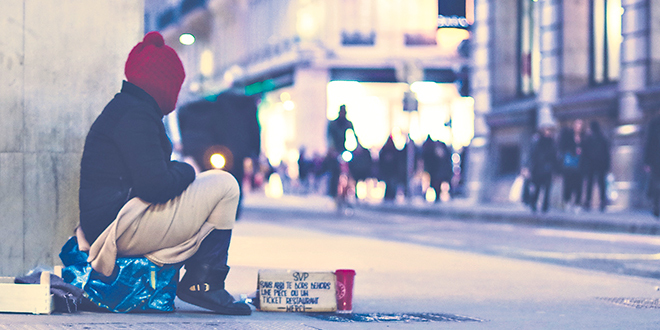 “Although homelessness in Australia continues to rise, the Budget offers no solution to putting a roof over the head of the more than 116,000 people experiencing homelessness and those on low incomes suffering severe rental stress. “The treasurer says a strong economy is the key to delivering better government services. Ms Victory said the continuing refusal to address the low level of support for people on Newstart was “harsh”. Treasurer Frydenberg pledged a one-off payment of $75 to singles and $125 to couples on Newstart to assist with energy bills. “The Society will continue to offer help and hope to these families and individuals,” Ms Victory said. Catholic Social Services chief executive officer Jesuit Father Frank Brennan said there were few positives to come from what he called an “election budget”. “Many Australians will be pleased because there’s a surplus, tax cuts and spending on infrastructure,” Fr Brennan said. Fr Brennan was concerned for the lack of funding attributed to one of Australia’s darkest and least discussed problems. “I think we all need to admit that the allocation of a mere $5m over four years to address the present endemic situation of Aboriginal youth suicide is just lamentable,” he said. Fr Brennan said that there was some good news that came from the Budget. “We’re delighted to see that the funding for the disability Royal Commission will be full and adequate at $500 million,” he said. “And the government is to provide $328 million of four years on programs to reduce domestic and family violence. The National Catholic Education Commission welcomed the Government’s formal budget commitment to better target funding for Australia’s low-fee schools. NCEC executive director Jacinta Collins acknowledged Education Minister Dan Tehan’s focus on low-fee schools, which educated so many disadvantaged students. “Now that the government’s funding package is locked into the Budget, the NCEC looks forward to seeing the detail of Labor’s plans for Catholic schools,” Ms Collins said. Ms Collins said Catholic schools were focused on addressing students’ future needs, particularly in early childhood education. “Early childhood education is so important and Catholic schools are well placed to meet this demand,” Ms Collins said. Ms Collins said the NCEC would continue to seek more funding and resources to improve education for its 765,000 students, particularly disadvantaged students. “That motivates everything we do,” Ms Collins said.